2017 got off to a fairly slow start with lots of snow days, hygge, and pho. The kids took turns in a constant rotation of flu, cold, and stomach bugs; but thankfully, looking back, all I really remember is extra snuggles and home time. Fern’s adventures at OHSU continued with our first appointment in the CDRC (Childhood Developmental Rehabilitation Center) and we added a wonderful physical therapist, Helga, to her team of providers. In February, we completed our first hike as a family of 5, in near-freezing temperatures, at Silver Falls State Park. Olivia celebrated her birthday with a dozen or so preschool friends by way of a unicorn-themed birthday party at our house, complete with a rainbow cake, piñata, and lots of glitter. Dan was able to sneak away for a weekend stay-cation with “his dudes”, experiencing Portland through kid-free eyes. In the Spring, we made our first “triangle trip” as a family of 5: Portland -> Dallas -> Orange County. Texas highlights included: a trip to the Dallas Arboretum with loads of pals, day trip to Ft. Worth to visit grandparents and a sweet new babe, some country-time with cousins and lots of filling up on salsa and Texas BBQ! Successful flights and juggling of 3 carseats and luggage for 5… California didn’t disappoint with always wonderful weather – Fern, especially, enjoyed loads of sunshine and tummy time in short sleeves! We made treks to Balboa and Laguna, rode by ferry and by boat, ate tacos at loco and walked on the pier. Gramma G treated Olivia to a special trip to the Magic Kingdom that she’s sure to say was the highlight of her year! In April, we had big plans to make some of our first REAL home improvements (new carpet!) which were somewhat more complicated than we bargained for. Upon returning home from our two-week vacation, we spent a few days in our own beds only to be out again. The discovery of asbestos flooring (hidden beneath our current carpet) resulted in a two-week process of abatement, demo, and rescheduling installation. Living in a hotel room for two weeks with three kids five and under isn’t for the faint of heart! That said, Townes still celebrated his third year and the Easter Bunny managed to find us, in spite of the circumstances! With fresh new carpet, in May we finally officially celebrated our little Townes man with a “pancake party” at home with a few of his close buds. Olivia danced around the Maypole wearing a crown of flowers at the May Day celebration at her preschool. For Memorial Day weekend, Papa G came for a quick visit and helped us check another project off the list: New stairs off the back of our house. We also managed hikes to Wachlella Falls in the Columbia River Gorge and a nature walk through the Redwoods at the Hoyt Arboretum. As always, our plans to u-pick our way through summer went off without a hitch starting with strawberries in June. Trying our own hands at a green thumb, we planted, and successfully grew, several of our own veggies in our backyard garden this year. Olivia enjoyed her last few days of preschool and we kicked off summer with lots of playdates and splash pad adventures. Both kiddos are becoming great little hikers and enjoyed “Super Nature Adventures” to Tryon Creek State Park, Powell Butte Nature Park and Wapato Greenway on Sauvie Island. July was packed with summer concerts at Kruger Farms, more berries, and a week-long escape to Redmond/Bend with Gramma G. Come August, Mamaw brought Remie for a special cousin visit and we hiked our last hike in the Gorge as we knew it before a massive fire broke out, scorching most of our favorite trails. Olivia enjoyed her first summer day-camp at the South West Community Center Community Gardens and Townes at Woodhaven Preschool camp. We walked in our neighborhood “Multnomah Days” parade and enjoyed the Solar Eclipse at 98% totality from our backyard. The kids would say the highlight of our summer was the addition of 6 laying hens to our family and our official embarkation on an urban homestead journey. Affectionately named, Waffles, Oakie, Lay-A, Coconut, and Sam and Ella, they are slowly adjusting to their extra-snuggly handlers. Because many will ask, we get 5-6 eggs a day in the spring/summer and 2-3 in the winter. September was a big month of change for us. 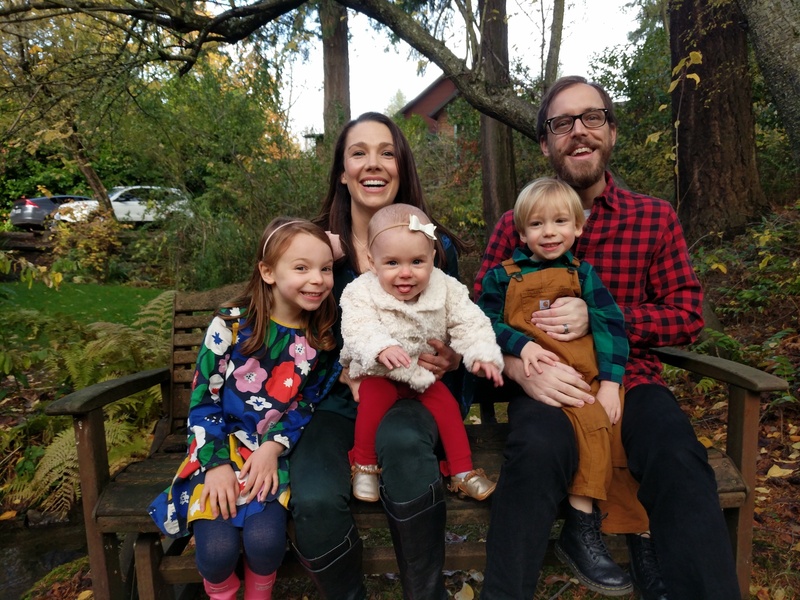 All within its first week, Olivia started Kindergarten at the neighborhood elementary school, Townes started preschool at our sweet Waldorf-inspired co-op, and Fern turned one! We spent the bulk of the month adjusting to our new routine and pick-up/drop-off schedules but were nonetheless lucky to squeeze in some Auntie and Uncle time with all my siblings in town for a long weekend. My brother, Christopher, also settled in to a pretty consistent schedule at work leaving us looking forward to “Chip Fridays.” I am so thankful for his help ushering us in to the weekend each week and the kids adore having a fresh audience. Gramma G made an extra trip in October and got to experience the cusp of Fall in the Pacific Northwest with some misty morning hikes and apple picking. We were lucky with plenty of dry weekends for a few family pumpkin adventures followed by one very soggy field trip to Bella Organics on Sauvie Island. On Halloween, with a ballerina, train engineer and sleepy little bumblebee, we enjoyed trick or treating with Olivia’s kinder pals. Favorite fall hikes included Hoyt Arboretum, Forest Park “Witches’ Castle” and a “leaf walk” at Laurelhurst Park. November brought lots of germs and sick bugs to our house. Fern had her first febrile seizure, in Fernie fashion, sending us to the ER by ambulance and keeping us on our toes. Dan started a new job at Polysync – math, and self-driven cars is what he does. We welcomed the darker days with a celebration of light and giving with a sweet Waldorf tradition, a lantern walk through the forest, at Townes’s school. November was filled with long afternoons practicing reading fireside with hot apple cider and popcorn. We hosted Thanksgiving with Auntie B and Uncle Chip and enjoyed a fabulous ballet performance starring none other than Olivia Kate Pittman. We “opted outside” and selected our annual Noble Fir at a Christmas tree farm in Sherwood. Unfortunately, Friday also brought on Fern’s second and third seizures and we spent 24 hours in the ER running all sorts of tests. A black Friday indeed. Thankfully, December brought unusually dry weather and we’ve been fortunate to enjoy lots of Christmas activities outside! Townes walked in his first spiral walk at Woodhaven, another wonderful Waldorf tradition. The children walk to the center of a spiral of evergreen branches where they light a candle, then retrace their steps back to their families. Singing and watching the light in the room grow was such a wonderful reminder of the light we carry within, and the importance of sharing it with others during this season. The days are extra short here; sunset on the solstice is at 4:29 pm! I’ve really come to enjoy the opportunity to spend extra time creating coziness and warmth at home. We’re still working our way through a long list of advent actives and looking forward to a solstice hike, the grotto lights, Peacock Lane, and spending lots of our hygge time with family and friends! We are, again, so thankful for the enormous amount of support and love we’ve felt from our friends and family this year as we navigate through becoming a family of 5 and the ongoing FernieJourney. This has definitely been a year of growing deeper in many of our relationships and friendships (far and near) and we are profoundly grateful for our “village.” Our plans for next year include a summertime trip with friends to the San Juan Islands, celebrating both grandmas turning the big 6-0, some home improvements, and hopefully dipping our toes in the Pacific. Who knows, maybe 2018 will be the year we brave a campsite with kids?! We sincerely hope that your holiday season is filled with love, light, and peace! “I’ve been listening to the radio today, and it’s got me thinking about Adorno’s Dialectic of Enlightenment. Which could ultimately be reduced to: Capitalism gives us existential cavities, because we’re so broken at the end of a work day, we just want to consume cultural M&M’s. Wallace talks about this in Although of Course You End Up Becoming Yourself. Paraphrasing: if all you consume is this, you will die. In a meaningful way, you will die. But his assessment does not include the cause, only the symptom. It’s not about incremental fixes, filling those cavities, those holes in our souls, with the occasional square meal. It’s a complete change in diet. Art could save the world.” – From my own notes this year. These inclinations lead to me joining up with the Democratic Socialists of America, and although time does not permit much activism, I at least make it to monthly meetings to get updates from the folks who do. On a first name basis with the Instacart and Prime-Now shoppers, I am super thankful for the multitude of grocery delivery options and am proud to say that it’s been months since I set foot in the grocery store with 3 kids in tow! Meal planning, Pinteresting and scouting fun stuff to do, is how I spend the few moments each morning before the kiddos wake up. On the board at Woodhaven, I’ve really enjoyed playing an integral role in directing our little Waldorf co-op. Cooking, cleaning and chauffeuring fill most of my days but I sincerely find so much joy in some of this mundanity. Watching our kids grow and change and helping them become good humans is the most rewarding work. Still dreaming of the day the yoga mat will stop collecting dust and showers are a more regular thing but for now I find pride in my ability to just be the glue that holds us together (with Dan, of course). Currently enjoying the research phase of all things urban homestead and look forward to lots of home projects in the near future. If you hadn’t guessed already, Olivia is really into ballet at the moment and we have plans to get her started in some classes this Spring. She is loving Kindergarten and is becoming an excellent writer and reader. She loves handling the chicken chores (at least the fun ones) and is an expert at both wrangling and snuggling. She’s an excellent conversationalist, never leaves without a big hug and is blowing our minds with how self-aware and empathic she is becoming. This year has brought a new-found confidence and level of independence that we’ve been waiting for. Olivia (mostly) appropriately dresses herself everyday for school, can whip up a personal batch of guacamole, and loves to fetch the mail from the mailbox solo. Her favorite foods are breakfast burritos and pho, just like her mama. Townes is sweet and mild; such a snuggler. He has really blossomed in preschool and most days at pick-up can’t wait to tell me all about what he did, who he played with and what the snack was. On days home, he is quite the taskmaster and loves to help with laundry and dishes. Playing with trains, Magnatiles, animals, and marbles are his favorite solo activities. Anything with a button or switch and you can bet that this little dude wants to see what it will do. He’s a tinkerer and thinker – always wanting to understand how things work. While just barely on the growth chart, he’s a slender little fella who, like his Dayda, loves chicken tacos! One-on-One time with this little guy is priceless, he looks forward to Maplewood Coffee dates with mama and going to Powell’s with Dayda. Fern is so sweet and easy going. Just happy to be held, to watch and wait for someone to engage her, she mostly qualifies as an “easy baby”. I am thankful that Fern’s story is just a tad bit different, as some of her developmental delays have really allowed me to soak up just a tiny bit more time with her in the infant stage. Now sitting unassisted, doing some standing, lots of clapping and smiling, she’s excelled so much with physical therapy and we couldn’t be more proud of how hard she’s working to overcome. In typical 1-year old fashion, she loves getting into everything, loves to play with anything she’s not allowed to and still puts everything in her mouth (including, but not limited to: faces, fingers, hair, and anything paper, plastic or resembling a wrapper.) She loves anything that makes sound and feels like such a big kid when her big brother and sister include her in their games! She loves guacamole, hummus, and chili and makes a huge mess at every meal. Always a positive force, she truly is the perfect completion of our family. This entry was posted in Family P, Uncategorized and tagged 2017, aferniejourney, christmas, family, newsletter, update.